Background: QSAR models as PLS, GFA, and 3D were developed for a series of matriptase inhibitors using 35 piperidyl-cyclohexylurea compounds. The training and test sets were divided into a set of 28 and 8 compounds, respectively and the pki values of each compound were used in the analysis. Methods: Docking and alignment methodologies were used to develop models in 3D QSAR. The best models among all were selected on the basis of regression statistics as r2, predictive r2 and Friedman Lack of fit measure. Hydrogen donors and rotatable bonds were found to be positively correlated properties for this target. The models were validated and used for the prediction of new compounds. 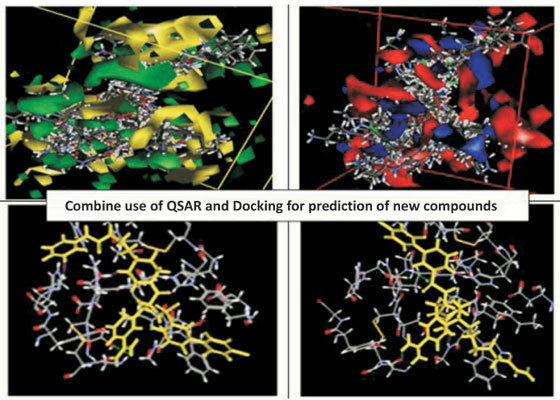 Based on the predictions of 3D-QSAR model, 17 new compounds were prepared and their activities were predicted and compared with the active compound. Prediction of activities was performed for these 18 compounds using consensus results of all models. ADMET was also performed for the best-chosen compound and compared with the known active. Results and Conclusion: The developed model was able to validate the obtained results and can be successfully used to predict new potential and active compounds. Keywords: QSAR, docking studies, piperidyl-cyclohexylurea derivatives, matriptase, ADMET, GFA. Keywords:QSAR, docking studies, piperidyl-cyclohexylurea derivatives, matriptase, ADMET, GFA. Abstract:Background: QSAR models as PLS, GFA, and 3D were developed for a series of matriptase inhibitors using 35 piperidyl-cyclohexylurea compounds. The training and test sets were divided into a set of 28 and 8 compounds, respectively and the pki values of each compound were used in the analysis.